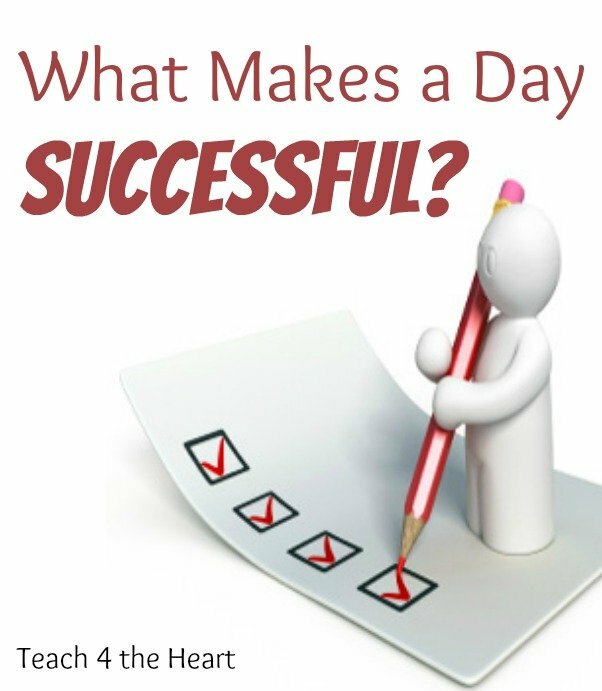 >> What Makes a Day Successful? When you sit down at the end of the day, how do you mark whether or not the day was successful? What makes you feel like you had a good day? Maybe a successful day is based on how much you got done. Or how much fun you had. Or whether or not you felt like you made a difference. Maybe the success of a day depends on how good the kids were or how few interruptions came up. Or maybe – due to a particularly spiritual mood (or the fact that we happened to do something particularly “spiritual” that day), we call a day successful because we went on visitation or taught a Sunday school class. 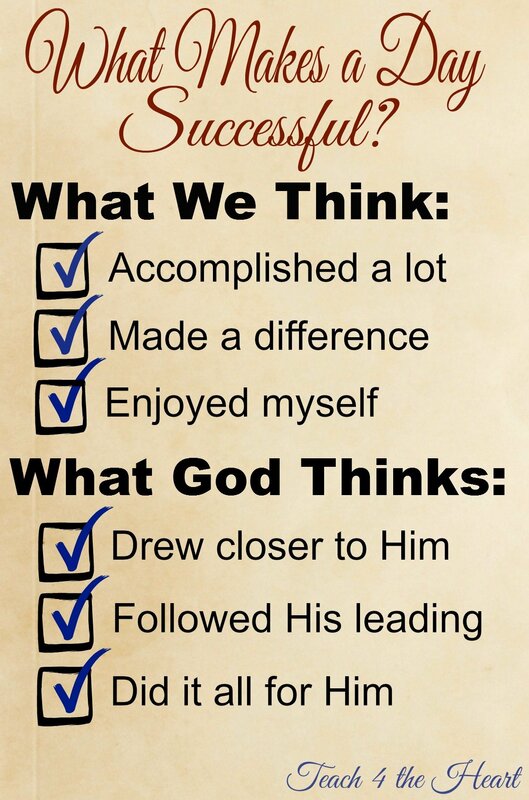 We really “accomplished something for Christ,” we think. I’ll tell you how I usually feel – I like to get things done, to feel like I accomplished something. So a great day for me is one in which the kids are good enough that we can get a lot done and I can get a lot checked off my to-do list. My biggest nightmare (literally – I dream these nightmares all the time) is when I am just treading water and getting nothing done. But are these really the marks of a successful day? Or, at least, I don’t think God would think so. And that’s all that matters, doesn’t it? What Does God Consider a Successful Day to Be? When God looks at our day, He considers it successful if…. We grow closer to Him. Did we spend time with Christ today? Did we read His Word? Did we talk to Him throughout the day? Did we depend on Him, rely on Him? Seek Him? That, more than anything, makes Him smile with pleasure. We follow His Word and His leading. Did we follow God’s plan today? Did we respond to His leading? Did we obey His Word? Whether we think His plans for the day were big or small, all that matters is if we were faithful in what He gave us. We do everything for Him. Col 3:23 says that whatever we do, we are to do it heartily as to the Lord and not unto men. So, did we cook dinner as unto the Lord? Did we grade papers for Christ? Did we disciple and discipline for the glory of God? It doesn’t matter how mundane or important the task – the real question is – what was our motive in doing it? Were we just checking it off a list? Were we doing it for our own praise? Or did we do it for Christ? We bring Him glory. Did our day bring glory to Christ? Believe it or not, I don’t think this is based on whether we had an amazingly great spiritual experience or whether we were able to specifically witness to someone that day. Of course, those things bring glory to God, but God is also glorified when we’re patient with the kids, when we sing to Him as we clean the house, when we put our spouse before ourselves, or when we keep the right attitude during a challenging meeting. So it doesn’t matter how messy our day was, how little we feel like we accomplished, or whether or not we felt like we did something “spiritual.” God is most pleased when we follow Him in the little things, when we seek Him throughout the day, and when we are faithful in whatever He gives us. Whatever our day holds – even if it feels like it’s just endless grading, rocking a crying baby, or cleaning up after toddlers – it can be a good day, a successful day, a God-pleasing day. If we keep our focus on Him.